Draft: 2005, Cincinnati Reds, 42nd rd. John Berton Axford... Drafted by Seattle in 2001 but chose to attend the University of Notre Dame where he pitched in the 2002 College World Series as a freshman... Did not pitch in 2004 after he underwent "Tommy John" surgery on his right elbow...Returned to Notre Dame but pitched just 3.0 innings during the 2005 season... Drafted by Cincinnati in 2005 but chose to attend Canisius College for the 2006 season where he earned a Master's Degree in Sports Administration... Pitched for the Melville Millionaires of the Western Major Baseball League (a Canadian summer league) in 2006...Played for Team Canada in the 2013 World Baseball Classic, allowing a run on two hits over 1.2 innings... Supports the Movember Foundation through which he helps raise awareness for prostate cancer with his facial hair...Has been a sponsor and donator to the Milwaukee Film Festival since 2011...Was on staff in 2016 to help create the Festival's "Sportsball! ", a collection of documentary films that puts audiences in the moment of an amazing achievement, tells the story of the athlete making the achievement, or gives you a perspective on sports that previously you never realized existed. Held left-handed hitters to a .151 (11-for-73) batting average... Limited his opponents to a .185 (17-for-92) average while on the road... Played 45 games for the Blue Jays and went 4-1 with a 4.41 ERA... On March 29 vs. NYY, became the 26th Canadian-born player to wear a Blue Jays uniform (10th born in Ontario)... Pitched in his 500th game on April 17 (1) vs. KC, becoming the 7th Canadian to reach the plateau... Threw a career-high 2.1 innings (0H, 0BB, 1K) on just 18 pitches on May 3 (1) at CLE... Had 18 previous outings of 2.0 innings... Did not allow a run from April 22-May 17 (12.1 IP), then 2nd longest active scoreless streak among AL RPs at the time.. Earned his 1st win as a Blue Jay on June 9 vs. BAL... Also reached the 500-inning plateau, becoming the 7th Canadian-born pitcher all-time with 500+ games played and 500+ IP... Picked up a W on July 20 and 22 vs. BAL, giving him wins in consecutive outings for the 2nd time in his career (also June 8-10, 2010). .. On July 28 at CWS, made his 1st career start after pitching in 537 games, the 7th most games pitched all-time before a 1st start... Became the 6th Canadian starter in Blue Jays history... Along with Russell Martin, formed the 1st ever all-Canadian battery mates to start a game in team history... Also became the 26th pitcher all-time to make his 1st start at the age of 35 or older…Threw a career-long 3.0 IP and faced the minimum (1H, 3K)... Was traded to the Dodgers in exchange for RHP Corey Copping on July 31... Made his Los Angeles debut on Aug. 4 vs. HOU... Landed on the DL from Aug. 14-Sept. 16... Made two appearances after returning from the DL (0.1 IP, 4H, 1ER)... Did not make LA's postseason roster. Started the season on the disabled list with a strained right shoulder...Marked his 1st career stint on the DL...Did not allow a run during a three-game rehab assignment with Triple-A Nashville...Joined the A's bullpen on May 20 ... Made his 2017 debut on May 21 vs. BOS (1.0 IP, 1H, 1ER) ... Allowed six earned runs over his first five appearances (4.2 IP) ... Did not allow a run over his next five games (5.1 IP, 2H, 3BB, 7K) ... Surrendered a home run in consecutive outings for the 5th time in his career on June 15 vs. NYY and June 19 vs. HOU ... Walked a career-high four batters in one inning on July 3 vs. CWS ... Was designated for assignment on July 27 and released on July 30 ... Allowed runs in 12 of his 22 outings for a career-high 6.43 ERA...Struck out 21 batters over 21.0 innings pitched. Went 6-4 with three saves and a 3.97 ERA in 68 relief appearances in his first season with the A's…struck out 60 batters in 65.2 innings and his average of 8.22 strikeouts per nine innings was the lowest mark of his career…had a 2.70 ERA over his first 26 games and a 2.19 ERA over his final 24 but logged a 9.42 ERA in 18 games in between (June 15 to July 25)…tied for second among American League relievers in blown saves (7), but only one came in the ninth inning or later…tied for fourth in most walks (30) and has now issued 215 free passes since the start of the 2010 season, which are the most in the majors by a reliever…tied for seventh among AL relievers in 2016 in wins (6)…allowed 8-of-16 (50.0%) inherited runners to score…first batters faced hit .281 but he issued just three walks (.324 on-base percentage) and allowed just two doubles (.313 slugging percentage)…opponents hit .258, including .256 (30-for-117) by left-handed hitters and .259 (35-for-135) by right-handers…surrendered four of his six home runs with two outs…four came with runners on base …yielded a .305 average with runners in scoring position, including .387 with RISP and two outs…had a .211 career average with RISP, including .185 with RISP and two outs entering the season…opponents were 4-for-6 (.667) with a walk and a grand slam with the bases loaded…compiled a 5.09 ERA and .293 opponents batting average in 39 games before the All-Star Break, a 2.67 ERA and .214 opponents average after the break…surrendered five home runs in 35.1 innings before the break, one in 30.1 innings after the break…logged a 5.14 ERA in 32 games on zero or one day of rest compared to a 3.11 ERA in 36 games on three days rest or more…allowed 11 of his 30 runs over innings three through six (18.56 ERA)…has a 2.68 ERA from the seventh inning on…had a 3.48 ERA in 34 games at home, 4.50 in 34 contests on the road…compiled a 7.56 ERA in 11 interleague outings compared to 3.45 in 57 games against AL opponents…induced a career-high seven grounded into double plays…opponents were successful in each of their four stolen bases attempts off him and are 34-for-43 (79.1%) with him on the mound in his career…tossed 1194 pitches, which were ninth most among AL relievers…tossed one inning or fewer in 59 of his 68 appearances. Was 4-5 with a 4.20 ERA and a team-leading 25 saves in 60 relief appearances in his first season with Colorado…tied for second in the National League with six blown saves and his save percentage of 80.6% was second lowest in the NL to the Phillies Ken Giles (75.0%)…tied for fourth among NL relievers in walks (32)…struck out 62 batters in 55.2 innings, an average of 10.02 per nine innings…compiled a 2.70 ERA and .216 opponents batting average in 28 games on the road compared to a 5.59 ERA and .298 opponents average in 32 games at Coors Field…did not allow a run (14.0 ip) and converted all 11 of his save opportunities in 14 outings on no days rest…had a 4.12 ERA in 20 games on one day of rest and a 6.95 ERA in 26 appearances with two days rest or more…converted 16-of-17 (94.1%) save opportunities and had a 2.36 ERA and .218 opponents batting average in 29 appearances before the All-Star Break…then went 9-for-14 (64.3%) with a 5.90 ERA and .296 opponents average in 31 games after the break…allowed a .259 opponents batting average, which included a .258 (25-for-97) mark against left-handed hitters compared to .261 (31-for-119) against right-handers…yielded a .160 average with runners in scoring position and two outs and has a .185 (37-for-200) career opponents average in that situation…first batters faced hit .185 with one extra base hit (double) and six walks (.267 on-base percentage)…his .204 slugging percentage against first batters was fourth lowest in the NL…allowed 3-of-5 (60.0%) inherited runners to score…had a 2.11 ERA during the day and was successful each of his 11 save chances…logged a 5.50 ERA at night…was 1-2 with two saves, an 8.64 ERA and .395 opponents batting average in nine interleague appearances…opponents were successful in 8-of-10 (80.0%) stolen base attempts off him and he tied for fifth among NL relievers in most stolen bases allowed…had the first pickoff of his career…tossed exactly 1.0 inning in 49 of his 60 appearances. Went 2-4 with a 3.95 ERA (54.2 IP, 24 ER) in 62 total games between Cleveland and Pittsburgh...Began season as Cleveland's closer and posted 10 saves in 11 chances thru May 4...Went 0-1 with 10 saves and a 2.31 ERA (11.2 IP, 3 ER) in his first 13 games thru May 4...Was charged with just two earned runs in 13.2 IP over a 15-game span from June 22 thru Aug. 4...Was claimed off waivers by Pittsburgh on Aug. 14...was scored upon three times in his 11 games with Pirates. ?he hard-throwing right-hander split the 2013 season between Milwaukee and St. Louis, going a combined 7-7 with a 4.02 ERA in 75 relief appearances (65.0IP, 73H, 29ER, 26BB, 65K)...He finished tied for 4th in the NL in games pitched and recorded a Postseason ERA of 1.59 in 6 games for the National League Champion Cardinals (5.2IP, 2H, 1ER, 9K, .105AVG) after posting scoreless outings over his final nine regular season appearances (7.2IP, 11K) for St. Louis...After recording an April ERA of 8.44, Axford enjoyed a stretch from May 15-July 24 where he allowed just 1 run (1ER/28.0IP) over 32 outings... Had a career high 20.1 IP scoreless streak spanning 23 games during that span. Won his 7th game overall on 9/20 at MIL, tied for 3rd among National League relief pitchers in wins...Had 19 holds (T13th, NL) and seven blown saves (T2nd, NL)...He has never been on the Disabled List over his five-year big league career. Went 5-8 with a 4.67 ERA and 35 saves in a career-high 75 relief appearances ... Struck out a career-high 93 batters in just 69.1 innings while opponents batted .229 Went 35-for-44 in save opportunities (79.5%) ... ranked sixth in the National League in saves. Led the Major Leagues in blown saves (9) but converted 17 of his last 18 opportunities. Had a streak of 49 consecutive saves converted snapped on 5/11 vs. Chicago-NL ... his streak ranked fourth in Major League history, trailing only Eric Gagne (84), Tom Gordon (54) and Jose Valverde (51). Notched his 100th career save on 9/16 vs. New York-NL and joined Dan Plesac (133) as the only pitchers in franchise history to reach that total. Joined Dan Plesac (1988-89) as the only pitchers in franchise history to produce 30+ saves in consecutive seasons. Retired 48 of 75 ﬁ rst batters faced (64%). Stranded 17 of 23 inherited runners (73.9%). Signed a 1-year contract on 1/18/13, avoiding arbitration. Was selected to the Canadian provisional roster for the 2013 World Baseball Classic. Was named Brewers Top Newcomer as voted on by members of the Milwaukee Chapter of theBaseball Writers Association of America ... Was named to Baseball America's All-Rookie team ... Began the season at Triple-A Nashville, where he went 3-2 with a 2.03 ERA and 2 saves in12 relief appearances ... Was recalled by Milwaukee on 5/15 ... Went 8-2 with a 2.48 ERA and 24 saves in 50 relief appearances as he enjoyed one of the bestrookie seasons ever by a Brewers pitcher ... Struck out 76 batters in just 58.0 innings while holding opponents to a .204 batting average ... Retired 34 of 50 first batters faced (68%) ... Stranded 11 of 14 inherited runners (78.6%) ... His 24 saves were the most ever by a Brewers rookie ... the previous record of 15 was heldby Doug Henry in 1991 ... Went 24-for-27 in save opportunities (88.9%) ... his blown saves came on 7/24 vs. Washington,8/9 vs. Arizona and 9/28 vs. New York-NL ... converted each of his first 14 chances ... His 88.9 save percentage ranked fifth in the National League (minimum 20 save opportunities) ... Had 9 saves of 4+ outs, trailing only the Giants' Brian Wilson (10) for the Major League lead ... His first save of the season came on 5/23 at Minnesota ... was seventh in the National Leaguein saves following the date of his first save ... Ranked third in the Major Leagues in wins as a reliever (8), trailing only the Nationals' TylerClippard (11) and Mariners' Brandon League (9) ... Notched his first Major League victory in the 4-3, 10-inning win on 5/27 vs. Houston ... His 7-game winning streak from 6/8-9/15 was the longest of the season by a Brewers pitcher. Climbed the ladder from Class-A Brevard County toDouble-A Huntsville to Triple-A Nashville to the majors...Went a combined 9-1 with a 2.77 ERA and 1 save in 45 relief appearances between Brevard County, Huntsville and Nashville...Struck out 89 batters in just 68.1 innings in the minors while holding opponents to a .185 batting average...Was a Florida State League All-Star...Contract was purchased by Milwaukee on 9/7...Went 0-0 with a 3.52 ERA and 1 save in 7 relief outings with the Brewers...opponents batted just .179 (5-for-28)...Made his Major League debut on 9/15 at Chicago-NL (1 IP, 1 H, 1 R, 1 ER, 3 BB, 1 K, 1 WP).....his first career strikeout was Kosuke Fukudome...His first Major League save came on the final day of the season as he preserved a 9-7, 10-inning victory on 10/4 at St. Louis for all-time saves leader Trevor Hoffman. April 4, 2019 RHP John Axford assigned to Buffalo Bisons. March 25, 2019 Toronto Blue Jays signed free agent RHP John Axford to a minor league contract. March 23, 2019 Toronto Blue Jays released RHP John Axford. March 23, 2019 Buffalo Bisons released RHP John Axford. 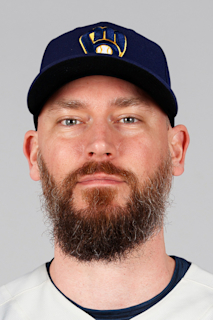 February 16, 2019 Toronto Blue Jays signed free agent RHP John Axford to a minor league contract and invited him to spring training. February 16, 2019 RHP John Axford assigned to Buffalo Bisons. October 29, 2018 RHP John Axford elected free agency. September 17, 2018 Los Angeles Dodgers activated RHP John Axford from the 10-day disabled list. September 14, 2018 RHP John Axford assigned to Rancho Cucamonga Quakes. September 14, 2018 Los Angeles Dodgers sent RHP John Axford on a rehab assignment to Rancho Cucamonga Quakes. August 14, 2018 Los Angeles Dodgers placed RHP John Axford on the 10-day disabled list. Right fibula fracture. August 3, 2018 Los Angeles Dodgers activated RHP John Axford. July 31, 2018 Toronto Blue Jays traded RHP John Axford to Los Angeles Dodgers for RHP Corey Copping. April 27, 2018 Toronto Blue Jays activated RHP John Axford from the bereavement list. April 23, 2018 Toronto Blue Jays placed RHP John Axford on the bereavement list. March 29, 2018 Toronto Blue Jays selected the contract of RHP John Axford from Buffalo Bisons. February 9, 2018 Toronto Blue Jays signed free agent RHP John Axford to a minor league contract and invited him to spring training. February 9, 2018 RHP John Axford assigned to Buffalo Bisons. July 30, 2017 Oakland Athletics released RHP John Axford. July 27, 2017 Oakland Athletics designated RHP John Axford for assignment. May 20, 2017 Oakland Athletics activated RHP John Axford from the 10-day disabled list. May 12, 2017 Oakland Athletics sent RHP John Axford on a rehab assignment to Nashville Sounds. April 5, 2017 Oakland Athletics placed RHP John Axford on the 10-day disabled list retroactive to April 2, 2016. Strained right shoulder. April 2, 2016 Oakland Athletics placed RHP John Axford on the 10-day disabled list. April 2, 2016 Oakland Athletics placed RHP John Axford on the 10-day disabled list. Strained right shoulder. December 11, 2015 Oakland Athletics signed free agent RHP John Axford. November 25, 2015 RHP John Axford elected free agency. November 20, 2015 Colorado Rockies designated RHP John Axford for assignment. July 4, 2015 Colorado Rockies activated RHP John Axford. June 30, 2015 RHP John Axford roster status changed by Colorado Rockies. April 22, 2015 Colorado Rockies activated RHP John Axford from the restricted list. April 19, 2015 Colorado Rockies placed RHP John Axford on the restricted list. April 12, 2015 RHP John Axford roster status changed by Colorado Rockies. March 1, 2015 Colorado Rockies selected the contract of RHP John Axford from Albuquerque Isotopes. February 2, 2015 RHP John Axford assigned to Albuquerque Isotopes. January 30, 2015 Colorado Rockies signed free agent RHP John Axford to a minor league contract and invited him to spring training. November 3, 2014 Pittsburgh Pirates sent RHP John Axford outright to Indianapolis Indians. October 25, 2014 Pittsburgh Pirates designated RHP John Axford for assignment. October 2, 2014 Pittsburgh Pirates activated RHP John Axford. October 1, 2014 Pittsburgh Pirates reassigned RHP John Axford to the minor leagues. August 15, 2014 Pittsburgh Pirates activated RHP John Axford. August 14, 2014 Pittsburgh Pirates claimed RHP John Axford off waivers from Cleveland Indians. December 19, 2013 Cleveland Indians signed free agent RHP John Axford. December 2, 2013 RHP John Axford elected free agency. August 30, 2013 Milwaukee Brewers traded RHP John Axford to St. Louis Cardinals for Player To Be Named Later. May 15, 2010 Milwaukee Brewers recalled John Axford from Nashville Sounds. March 23, 2010 Milwaukee Brewers optioned John Axford to Nashville Sounds. September 7, 2009 Milwaukee Brewers selected the contract of John Axford from Nashville Sounds. June 24, 2009 John Axford assigned to Nashville Sounds from Huntsville Stars. June 11, 2009 John Axford assigned to Huntsville Stars from Brevard County Manatees.